At some point in their career, every product developer has been guilty of slipping the old adage of “necessity is the mother of all invention” into a client presentation. They likely internally cringed at how cliched it sounds, and it is, yet it holds as true as they day it was coined by, assumedly[presumably], someone with a freudian relationship to their work. As brands change their practises to make use of big data and social analytics, necessity has become easier to discern than ever. That is, if the right techniques and data sources are analysed and employed correctly throughout the product development process. The data pool that gets marketers, entrepreneurs and big brands most excited is social media analytics. Seemingly bottomless, and continually growing in both volume and relevance, social media data has an enormous impact on the current landscape of consumer brands, influencing how they talk, how they interact, how they launch, and how they innovate their products. The ability to interpret and leverage billions of unstructured conversations has taken the FMCG industry by storm, completely revolutionising the product development process. Augmenting the R&D phase, brands can now use tools like Crimson Hexagon to compile detailed visual reports analysing unsolicited consumer preference expressed across social, including frustrations with existing products, global preferences and trends, and deep sentiment analysis about their own branded conversation, and that of their competitors. Social data isn’t a new phenomenon, but it is a fast-growing one. eMarketer reported back in 2016 that most marketers were already making use of social data. Sixty-four percent of marketers globally were using social data to guide strategy, with the greatest barriers for the remaining 36% being the time commitment involved, access to the right analysis tool, and possessing the expertise within their team. With the growing popularity of user-friendly tools like HelioSight, which uses advanced machine learning AI to understand millions of unstructured social posts on any topic or brand within seconds from a simple Google-like search, these barriers are rapidly becoming a thing of the past. With the too-hard-basket cast aside, no FMCG or packaged food brand today can afford to ignore social data in their product development process without potentially missing out on the chance to disrupt their category with crucial insights that their customers are giving away on social – freely and without the bias of solicited surveys. Let’s have a deeper dive into how a major Tuna brand in the APAC region used social data in their product development phases. Analysing overarching conversations across a product category or industry, brands can inform their product development with the breakout trends revealed within the parent conversation. When launching a new tuna product in the APAC region, it was important for the brand to make sure it will tantalise people’s taste buds in the right way. Crimson Hexagon allowed the brand to retrieve the emerging trends in tuna combinations. People are increasingly hailing the mighty fish as an additional ingredient, pairing it with pasta or choosing to have it as a tasty snack on its own. Identifying the trends are preferences of potential consumers is important to identify gaps in the market. There are few drivers of emotively-charged social posting that are more prolific than product frustration. Consumers expectations have never been higher than in this digital age, and it shows on platforms like Twitter and Reddit. Those who spend their hard earned money on products have very little resistance to venting when they fail to impress. This has traditionally been viewed as a pain-point for marketers, who would rather sweep it under the rug than detail it in their research findings, but this is another missed opportunity. The tuna brand decided to develop new flavours and combination profiles for their product, instead of conducting lengthy research and expensive focus groups, they could run a report on the APAC market using geo- location data and find out what tuna trends are getting the most social love, instantly, and up-to-the-minute. 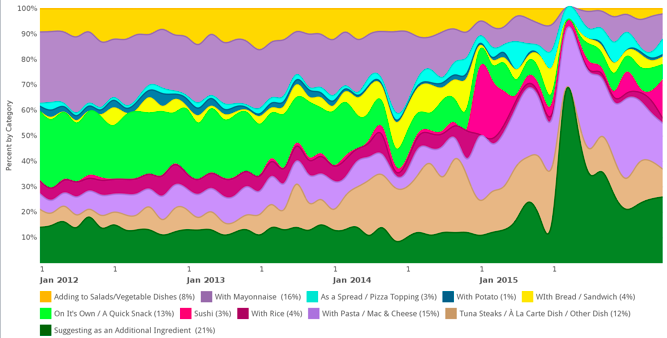 The social data immediately highlights that tuna and brown rice is a popular new combo. Deeper analysis reveals that the flavours of herbs, chilli and garlic are resonating with tuna lovers. These oriental flavours are reflective of the APAC region, and if you were to deep dive into other global regions it would probably reveal different taste preferences. Facebook and Instagram but also including blogs and forum posts. Crimson Hexagon’s ability to analyse social data is a powerful technique for finding the flavours that resonate with new audiences, or existing ones, and a total game-changer for defining flavour preferences across any market. This can be a powerful technique for finding the flavours that resonate with new audiences, or existing ones, and a total game-changer for defining flavour preferences across global markets. Social analytics is the new frontier in consumer analytics enabling marketers to have a truly global, regional and local perspective on consumer needs and trends and existing product frustrations. A social data approach to new product development allows you to undertake product analysis efficiently based on what the customer is discussing not what a researcher is asking, getting closer to what the consumer truly needs. If you have a project that you think would be great to have our help on, reach out via this link or give us a call. If you are in the area, even better! Drop in and say hello to the collective.